After several months of researching, testing, and using various tools for social media monitoring and response, I thought it might be helpful to share some of my findings. It was fun to dive into these tools, but I hope the information in this article will save you time and help you quickly find the tool that’s right for your needs. Why Bother Monitoring Social Media? Even if you or your clients have "decided" not to actively participate in social media, it’s really not a choice. Nature abhors a vacuum, and so does social media. Either you can fill the vacuum with your perspective, or your customers and competitors will fill it for you. The choice is clear. Monitoring helps with branding and marketing and can help identify quality control or customer care problems that may have gone unnoticed. Monitoring is only one piece of the puzzle, however. It’s important to find out who is saying what, and where the conversation is happening so you can respond appropriately. There are few terms you’ll need to be familiar with before we talk about the tools, so let’s take a moment to cover them before we jump into the details. If you find there are customers who have a strong opinion of your brand, it’s important to understand the influence of those customers. How many external links point to their blog? How many comments do their blog posts attract? Several of the free tools listed below include this measurement to assist in your monitoring and response efforts. All of the paid options include it. Are the comments positive or negative? Most current tools attempt to assign sentiment to a post automatically. While this is helpful for brands with tons of mentions, it’s only about 70% accurate in most cases, so manual verification and spot-checking is encouraged across the board before making any decisions based on influence data. This is simply the amount of "buzz" that exists. Many monitoring tools give the ability to chart volume for specific keywords over time. This gives you a great way to measure the impact of your marketing efforts and social media campaigns, especially when combined with sentiment. A lot can be learned about your brand and your customers by investigating spikes in social media volumes. Workflow is the process of assigning, tracking and responding to social media, typically in a team environment. An effective workflow can prevent double responses and missed opportunities. Now that we have an understanding of the purpose and the terminology surrounding social media monitoring, let’s take a look at some tools that can help you monitor your presence. An oldie but a goodie! Google Alerts allows you to set up keyword searches for the name of your company or competitors, for example, and receive updates in your email inbox or through an RSS feed. When combined with iGoogle, you can create a pretty nice consolidated page that contains the latest findings for your selected keywords. When it comes to monitoring social media, this is the least you should be doing; it’s free and an absolute snap to set up. By using the advanced features in Twitter’s search tool, you can use simple Boolean logic (true or false conditions) to perform some pretty powerful searches. 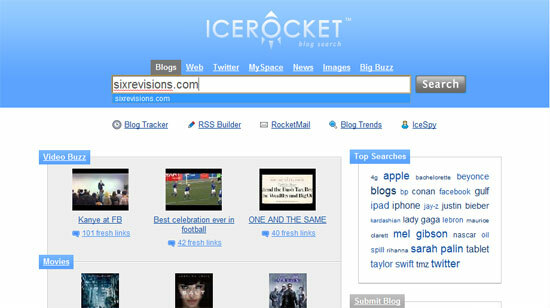 Used by many, Icerocket helps you keep watch over Twitter, blogs, web, news, images and more. 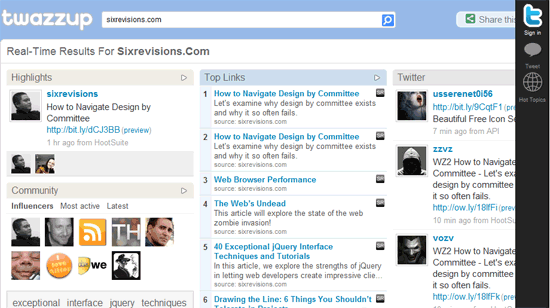 Features include a topic cloud and basic listing of mentions. 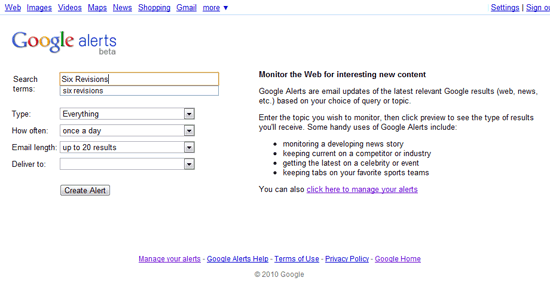 This social media monitoring tool also offers the ability to bookmark your search results for later reference. Although helpful, some users might find the interface and the style of the search results pages a little archaic compared to the other options. 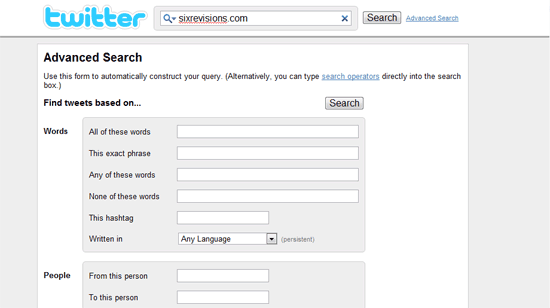 This tool is a consolidated page with search matches across blogs, Twitter, Digg, Flickr and more. Featuring an appealing interface and one-page dashboard, Addict-o-matic is one of the best free tools available for summarizing all your "buzz" in one place. 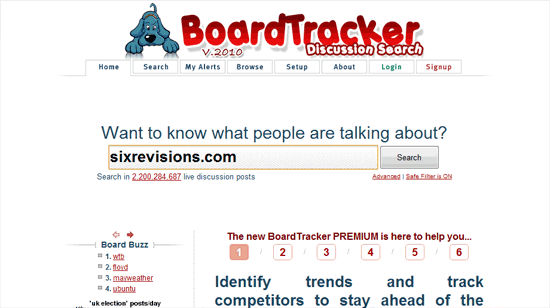 Boardtracker focuses on grabbing "buzz" from message boards and forums. Features include a topic cloud and influencer list. There are ads mixed in with your search results which may turn off some users. A premium version is offered. If your target customers are more active on message boards than other channels, this could be the right tool for you. Of the Twitter-focused monitoring tools I’ve come across, Twazzup does a great job of getting everything on one page. Sentiment, top links, and influencers are available. The ranking of influencers, however, seems a little mysterious. A quick check of Klout scores on profiles for a few key topics didn’t reflect a high level of influence, so Twazzup must be using a different calculation. This social media monitoring tool features an interesting combination of easy-to-read metrics including reach, sentiment, passion, and strength (volume/day). 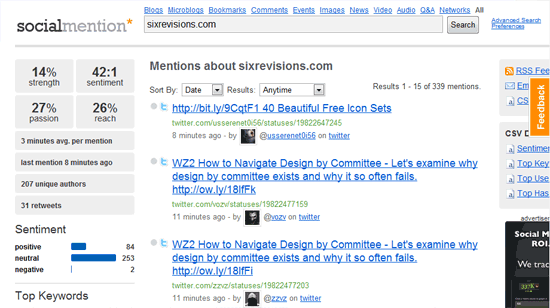 Social Mention tracks blogs, blog comments, Twitter, mainstream news, images, video, and audio. Searches can be saved as an RSS feed so you can easily stay up-to-date. 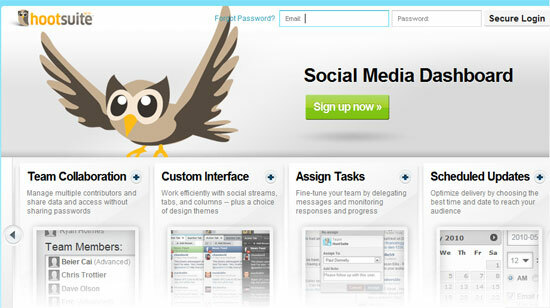 HootSuite is a popular tool that can be used to manage multiple accounts across Twitter, Facebook, MySpace, WordPress, Foursquare and LinkedIn. Although HootSuite could be categorized as an account management tool rather than a monitoring tool, I believe it deserves mention here because of its large user base and powerful functionality. You can push updates to one or more profiles, track click-through, deploy timed updates, monitor your social media buzz across multiple web services, and assign tasks among team members based on roles. 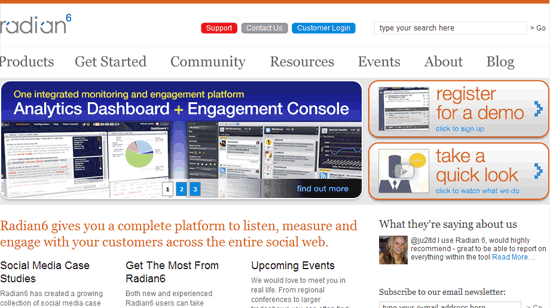 If you use HootSuite, you’ll want to use an additional tool to supplement monitoring of forums and blogs. HootSuite apps for both iPhone and Android are available. 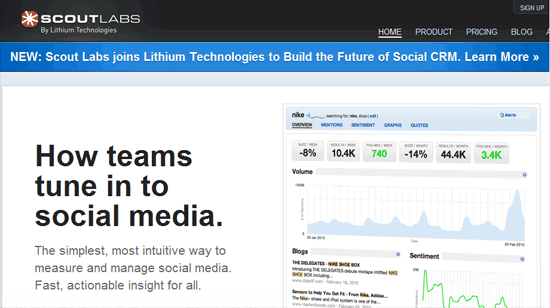 If you try HootSuite, you’ll find the interface of Seesmic fairly familiar. The similarity doesn’t end there. They also share the capability to manage multiple accounts across all the popular social media outlets. 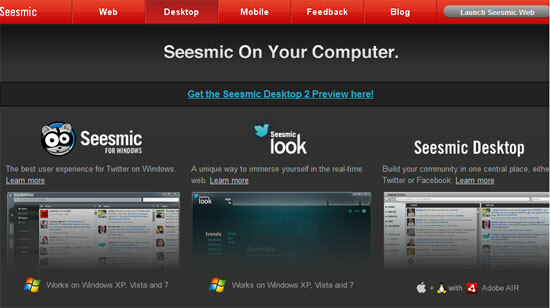 Seesmic gives up some ground to HootSuite, however, on the team collaboration and workflow front. 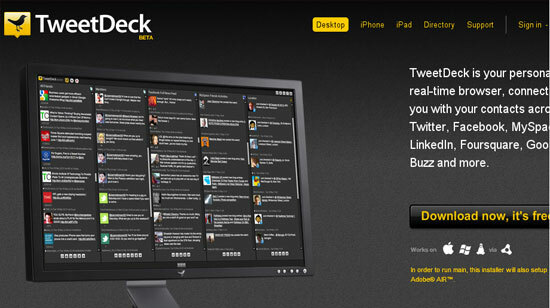 Another account management tool, TweetDeck is available as an application for Mac, Windows, Linux, iPhone and iPad. You can use TweetDeck to manage profiles across Twitter, Facebook, LinkedIn, MySpace, Foursquare and Google Buzz. If you’ve used the other tools on this list, the multi-column format will feel familiar. TweetDeck is lacking a good workflow, so it is not for those who will be collaborating with a team. In addition, because it needs to be installed on your system instead of being able to run in a Web browser, many people won’t be able to use it in a secure corporate environment. Scoutlabs has a great clean interface and overall excellent features for volume trending, sentiment-tracking, learning about key quotes (based on sentiment), and managing workflow for response management. Unlimited results helps protect you from increased monthly cost due to unexpected spikes in volume. It’s a great option for agencies and freelancers because you can give clients access to a dashboard with your logo on it, branding the service as your own. Note that it can be a challenge to output some graphs and reports which may be an issue if you want to produce reports for your clients. Radian6 is a powerhouse that gives you the ability to slice-and-dice your data until your head spins. Integrated workflow, alerts, sentiment, monitoring across blogs, forums, news, Twitter, and more is what this social media monitoring tool has to offer. The amount of monthly volume can influence pricing which is a little scary for companies that may experience wild swings in monthly volume. This is not the type of solution you should set up and hand over to your clients; it provides you with a wealth of information so you can become the go-to expert for them. If you invest the time to learn this tool, you can discover insights that will make you a hero to your clients. Is Automated Sentiment Analysis Reliable?